Planning a day’s getaway from Gokarna or Karwar? 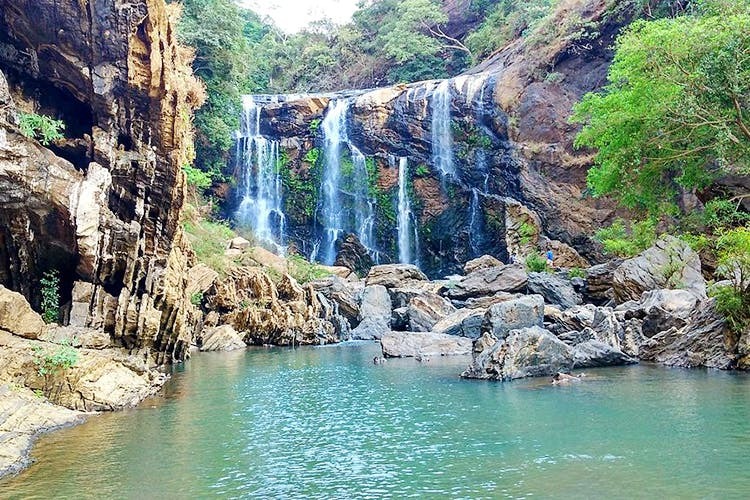 You can’t miss Uttara Kannada's gorgeous Sathodi Falls, that’s nestled amidst a green, green wonderland. If you think a gentle stream can’t do much, then, you’ve clearly not been to the Sathodi Falls in Uttara Kannada Disctrict. Here, a bunch of streams get together to form what is undeniably one of Karnataka’s most breathtaking waterfalls. Located near Yellapur, this is less than three hours from, both, Gokarna and Karwar. You can easily access it from the coastal town of Ankola as well. There are two things you simply can’t do without if you want to access Sathodi Waterfalls. One, is an SUV or its equivalent. And, second, the person behind the wheels needs to be one hell of a driver. The last 25kms to the falls can be pegged as a wild ride, at the very least, thanks to some unimaginably bad roads. And visiting during the monsoons is a strict no-no. But those who have been to Sathodi will tell you that it is all worth it. While the ride maybe bumpy, the views on offer are anything but disappointing. You can wander deep into the forest to catch a glimpse of the fall. There is an option to view the falls from afar but we recommend the close up. Surrounded by rocky terrain, Sathodi Falls cascades from a height that forms a pool at the base. You can dip your feet here and spend a couple of hours enjoying the beauty of falls. If you’d like double the fun, then, do stop by the Magod Falls nearby.